MADISON, Wis. —A janitorial supplies company owned by Supreme Court candidate Lisa Neubauer’s Democratic Party power player husband could have really cleaned up — thanks to legislation crafted by the businessman. He was long gone from the Legislature when he drafted the “final language of the bill” that was ultimately introduced by fellow Racine County Democrat Cory Mason. Now the mayor of Racine, Mason served in the Assembly at the time. Neubauer tells MacIver News Service that he merely followed “model legislation” being drafted across the country to make public places safer from indoor toxins. He said his wife’s decision to stop listing his company’s clients on her ethics forms had nothing to do with his legislative efforts. The Neubauers have positioned themselves as climate change warriors. Jeff Neubauer’s daughter, Greta Neubauer, ran for her state Assembly seat as a vocal proponent of the Green New Deal and his wife reportedly attended a climate change march in 2017 protesting President Donald Trump’s agenda (in between dumping her energy and big corporation stocks for a greener investment portfolio in 2016 and 2017). The company had 127 contracts with the state of Wisconsin alone in 2009, according to Statements of Economic Interests filed by Judge Lisa Neubauer. In 2010, the appeals court judge stopped listing Kranz’s clients on her SEI. State law requires state public officials and candidates to file statements of economic interests annually with the Wisconsin Ethics Commission. The documents identify the filer’s employer, investments, real estate, commercial clients and creditors, and the same information for the filer’s immediate family members. Documents show Jeff Neubauer’s company was paid nearly $15 million by the state of Wisconsin for janitorial supplies and services between 2005 and 2018. In 2017, Neubauer sold Kranz to Imperial Dade, a leading national distributor of disposable food service and janitorial supplies. 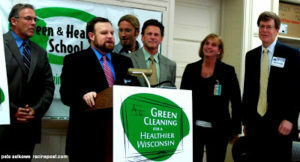 The folks we have been working with on the Healthy Green Cleaning bill have some additional edits to the bill,” wrote Michelle Michalak, an aide to Mason wrote to Becky Tradewell, a lawyer for the Legislative Reference Bureau, in an email dated Sept. 22, 2010. The subject line notes, “Final language for Healthy and Environmentally Sensitive Cleaning.” And the “folks” the lawmaker’s office had been “working with” were Jeff Neubauer and lobbyist Jason Childress, among others. “We have plans to have a press conference this Friday if there is any chance we could have this bill updated by Thursday that would be much appreciated. This bill is a big priority for Representative Mason and the Speaker,” Michalak wrote. A couple of hours before, the legislative aide received an urgent email from Neubauer, including the “final language for the bill.” He apologized to Mason for the delays in getting the final draft completed. “ … IF you can stomach one more conversation about this I would say the following: 1) Announce and release the bill in the form that is attached on Friday at an event with Curt Johnson in Racine. Nothing but good publicity will come from that. It is no lose, all upside for you,” Neubauer wrote. Neubauer referred to Curt Johnson, great-great-grandson of the founder of SC Johnson. Curt Johnson was the chairman of the former Johnson Wax Professional which became JohnsonDiversey, and, ultimately, Sealed Air Corps. in acquisition. Johnson, one of the wealthiest men in the world, worked with Neubauer to launch Green Racine, a program that enlists companies and organizations to commit to green cleaning and other environmentally friendly practices, according to the Racine Journal Times. Each company sold the kinds of green products and practices outlined in the Green Racine initiative. Neubauer instructed Mason’s office to contact Democratic Party power player Rich Judge, who now serves as executive director of the Greater Wisconsin Committee, a liberal special interest group. GWC’s independent expenditure arm, coincidentally, has dumped hundreds of thousands of dollars into TV ads attacking Judge Lisa Neubauer’s Supreme Court opponent, fellow appeals court Judge Brian Hagedorn. Jeff Neubauer wanted Judge to know that “we have a bill that labor will like much better” than a bill floated at the time by then-Sen. Jim Sullivan, a Democrat from Milwaukee County. Big Labor was definitely at the table for this bill, Neubauer boasted. “Nationally SEIU, AFSCME, AFT and the Teamsters all want a legislation that addresses training and safety for their members. This is the first bill in the country that does both. (NEA has not yet been asked to be a part of the effort, but those conversations are occurring this month and early discussions are very positive),” Neubauer wrote. “Then we can approach the School Boards and the Administrators to show them how they can be heroes in their communities and save money at the same time,” the cleaning services CEO wrote. It could have really made a difference for Kranz Inc., Jeff Neubauer and, by extension, his family, too. Mason took some heat at the time from critics who blasted the cozy connections. The state representative waved off the criticisms, arguing that the bill would make schools environmentally safer for kids and the people who use public buildings. Neubauer contributed at least $400 to Mason’s campaign between 2007 and 2009, according to state campaign finance records. He wrote a $100 check the day of the press conference announcing the green clean bill. JohnsonDiversey, which made the green products Kranz distributed, spent more than $30,000 in 2009 lobbying for green cleaning interests. The majority of that time was spent pushing Mason’s bill, according to a February 2010 article in the Racine Journal Times. Now to the potential contemporary conflict. Beginning in 2010, Judge Lisa Neubauer suddenly stopped providing lists of Kranz’s clients on her statements of economic interests. Before then, her statements included hundreds of Kranz customers. The judge filed an affidavit with the state ethics division in which she checked off a box that stated, “I have asked my spouse for this information, and my spouse has refused to provide it.” She further noted on the form that, “I do not have any knowledge relating to the identity of any of the customers, clients, or tenants of Kranz Inc. and I do not have a right to an accounting of this information.” Unless Kranz’s client list changed substantially, Lisa Neubauer certainly had at least some knowledge of the company’s customers. In an interview with MacIver News Service, Jeff Neubauer said his competitors could easily have found and targeted Kranz’s customers listed on his wife’s public statements. That’s why Judge Neubauer stopped listing them. But plenty of elected officials have had no problem complying with the disclosure provision. A Wisconsin Ethics Commission official told MacIver News Service that Judge Neubauer has a legal right to not disclose her husband’s customer information. Her failure to do so, however, has sure raised some questions. Jeff Neubauer said he thinks it’s “pretty clear” that his wife’s decision to omit Kranz’s business accounts had nothing to do with the legislation he crafted for Mason. “This was model legislation that was worked on across the country by a variety of states in an effort to remove toxic chemicals and to improve the indoor air quality across the country, particularly in schools,” he said. At the time, Mason answered critics by asserting that hundreds of U.S. companies were selling products that meet the green standards, and that Kranz certainly wouldn’t have had a monopoly on cleaning product sales. But critics counter that the bill was written to make the profits of companies like Jeff Neubauer’s Kranz Inc. “greener” with taxpayer-funded contracts.